What a well written story that captured me. I think this is such a sweet story with humor! Gina writes off men after a 10 year dead end relationship. But, her friend Ellen is getting married and Gina needs a date for the occasion. What unfolds is a story that had my cracking up! But also has some hot moments with Gina and Chris!! The tension is thick as a malt shake!! Yummy! Truth or Date has stuck with my like ice cream! 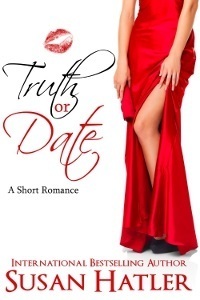 If you love a sweet romance Truth or Date is not to be missed. Pick it up! Ms. Hatler I hope you are writing Kristen's book as I need it!! This book stands alone nicely but it is better to read book one!